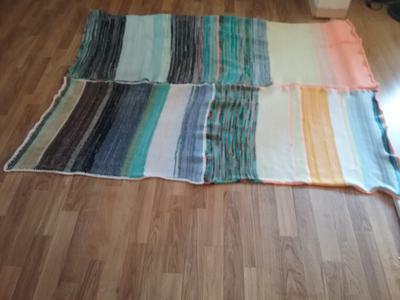 This blanket can be done by hand or with the knitting machine. If hand knit 4.5 mm needles. 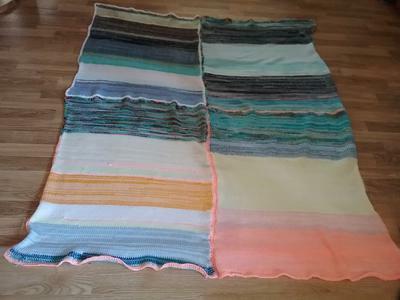 A combination of various weights of yarn was used for the project. Cast on 100 stitches. If machine knitting set tension at 6. Cast off and single crochet around all 4 edges. This is 1 section. Make 4 sections or more in total. Iron flat with a damp cloth very carefully as the fabric will burn if not extremely careful. A 5.00 mm crochet hook was used to crochet the sections together. Weave in all tails in three different directions to ensure that the ends of the project don't come loose through use.